Download Margot's article "Transforming Nature." Margot McMahon’s sculptures, drawings, and videos interpret her environmental vision of the interdependence of life forms in nature. Margot fuses human, plant and animal forms into unique sculptural statements that are inspired by familiar natural forms reinvented into a unique visual vocabulary. Each sculpture varies in its focus emphasizing the importance of life and nature. Her sculpture “Ecosystem No. 1” invites the viewer to participate in sustaining this small ecosystem by contributing water to the blue vessel. The sun powers a solar pump that lifts the water to the weather vane, or dancers, on top that spin to distribute the water on to a sedum or rooftop garden.The sedum is brought to eye level to experience the plant that absorbs and retains rainwater while insulating rooftops. If people, the sun and wind contribute, the garden will thrive. Margot exhibits her work in museums and galleries, collaborates with others for commissioned work and creates portrait exhibitions to congratulate and encourage lives well led. The gallery and museum exhibitions show her new work that expresses recent art explorations Margot has embarked upon. 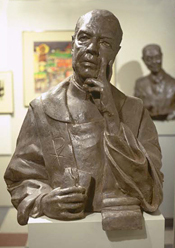 Her sculptures have been collected throughout the United States, Japan, England and France and the Smithsonian’s Portrait Gallery, Museum of Contemporary Art in Chicago, Chicago Botanic Garden, Chicago History Museum, Yale University, DePaul University, St. Patrick’s Church, The John D. and Catherine T. MacArthur Foundation and Soka Gakkai International. She sees the work as a result of an exploration of people within nature. Margot’s hope is that the art remains as a defined statement of where she has been, an object of what she has learned for others to create their own interpretations. Her portraits of unsung heroes, exemplified by “Just Plain Hardworking”, interprets ten everyday workers; an organizer, steel mill worker or homemaker as foundational elements of society. The Chicago History Museum and WTTW-Channel 11 brought “Just Plain Hardworking” to viewers to show how one generation helped create a multicultural fabric that makes up Chicago. “Just Plain Hardworking” is permanently exhibited in the John Egan Urban Center of DePaul University Campus Center on State and Jackson. Margot McMahon has worked with village boards, park districts, Catholic, Presbyterian and Buddhist centers, corporations and office buildings to sculpt images that she hopes will enlighten and provoke thought in the everyday life of the viewer. Her commissioned art is the result of meeting and learning the ideas of a community, then interpreting those ideas into sculptures. The focus of the symbol embellishes the blended forms of life that Margot carries throughout her body of work while the community she works with adds facets to her art. For several years Margot explored her Irish Catholic heritage through sculpting symbols for St. Patrick’s Church founded in 1949. A celtic wooden cross, a mural with words from St. Patrick’s Breastplate, a waterfall baptismal font for infants and adults, Stations of the Cross, a Holy Family with Jesus as a teenager and a loaf shaped rosewood tabernacle held by five foot high hands called “Offering”, stained and blown glass were the result of five years of Celtic Catholicism explored, learned and interpreted. 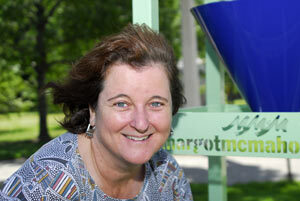 To respond to questions and explain processes and concepts, Margot has produced videos. These documentaries are further conversations with viewers to explain and reach a common understanding of how and why her objects are created. Cinema Guild in New York City distributes her videos. You can see a video of the Chicago Tree Project on Vimeo. Margot is a Board Member of Chicago Sculpture International and a Board Member of Yale Women and the Association of Yale Alumni. Currently Margot is working with The Chicago Literary Hall of Fame to portray 6 inaugural inductees.